The Zero Tension Mouse™ allows you to rest the arm and shoulder on the cradle for the hand. If you keep the mouse relatively close to the body the entire arm, shoulder and neck will relax. Most people feel an instant relief when switching to the Zero Tension Mouse™. The revolutionary Zero Tension Mouse™ allows all of the muscles of the hand, arm and shoulder to effectively relax. Whether you are working on the computer all day, gaming, or just surfing the net, the Zero Tension Mouse will allow you to do it with greater comfort and ease. Biomechanics, Zero Tension Mouse, and Cumulative Injury. A few years ago Dr. Michael Leahy defined the cumulative injury cycle and explained why soft tissues like nerves and muscles became injured with repetitive motion. Until this time the standard treatments were ultrasound, electrical stimulation, massage and nerve and muscle stretching. In general the problem was not resolved. Then came Active Release Techniques and all of a sudden surgeries were no longer needed and in general the problems were fixed in short order. Dr. Leahy then worked on how to prevent repetitive motion injuries from happening. He formulated the law of repetitive motion and defined the four factors involved in these injuries. The one factor that could be minimized was tension on the tissues or 'relaxation'of the muscles. If the muscles could be relaxed during the activity but still maintain function then the problem could be avoided and the employer would still be happy with production. With the Zero Tension Mouse all of the muscles of the hand, arm and shoulder/neck can relax and do so more effectively than with any other device in the world. In fact, nothing else comes close. Let's start with the hand. When the hand is completely relaxed the fingers flex and the hand is half way between a fist and completely straight. 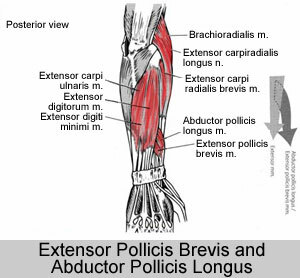 This balances the tension between the flexors and extensors of the fingers. 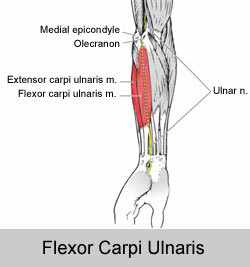 When the flexors are tight they can trap the median nerve and cause what is commonly but erroneously called "carpal tunnel syndrome". 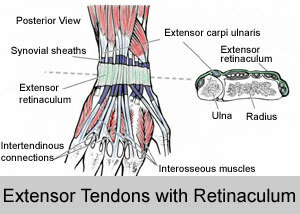 When the extensors are too tight they can cause epicondylitis or "tennis elbow". 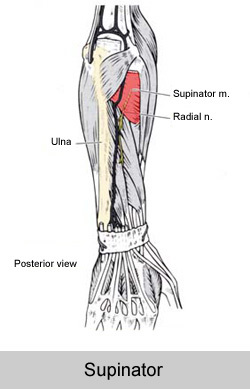 They can even trap the radial nerve and cause numbness in the hand. In order to prevent this the hand must be positioned so that it is not too straight and not closed too tight. The Zero Tension Mouse exactly balances the flexors and extensors so that they can relax. A regular mouse causes the extensors to tighten in order to hold the fingers slightly above the mouse buttons. They are under slight tension all the time which causes the cumulative injury effect. Next the wrist. With a regular mouse the wrist is usually extended slightly. 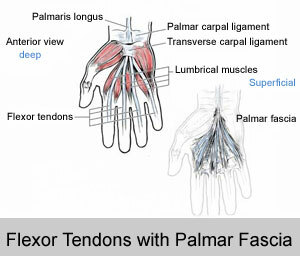 This is not a major problem but the tension on the wrist extensors to maintain this position is definitely a problem. 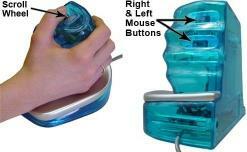 The Zero Tension Mouse eliminates this problem by placing the wrist in neutral between flexion and extension. It also places the wrist upright instead of flat so that the wrist extensors can relax instead of tightening to maintain position. 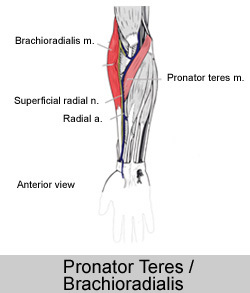 The wrist is upright instead of flat in order to balance the pronators and supinator. These muscles turn the palm up and down and in a regular mouse they twist the wrist palm down so that all three muscles are tight. 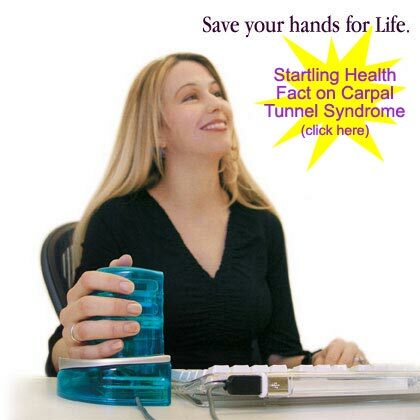 Over time this becomes a significant problem causing that all too familiar syndrome called "carpal tunnel." The thumb becomes a problem with mouse devices that require the thumb to be in position over a ball or multiple position switch that goes back and forth. These cause the muscles that extend or move the thumb sideways to tighten. 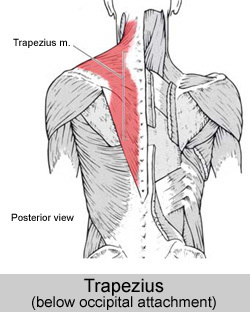 These muscles don't tolerate this for very long and quickly become painful. The Zero Tension Mouse™ avoids this by giving it a special place to rest and relax. When scrolling a page, if desired, you can move the thumb onto the scroll wheel and move it up and down then rest the thumb next to the scroll wheel when done. Probably the most important feature of the Zero Tension Mouse is it's ability to relax the shoulder and neck. 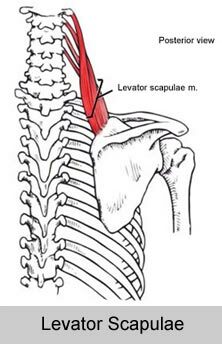 With a regular mouse the weight of the arm and shoulder is supported by the trapezius and levator scapulae muscles. 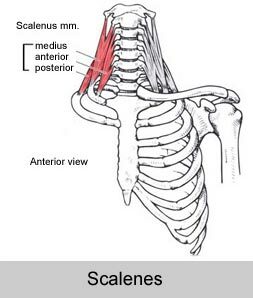 The scalenes also tighten as the shoulder is supported. This is because you cannot rest the weight of the arm and shoulder on the mouse while using it. Almost everyone has felt that 'burning' in the muscles between the neck and shoulder after using a regular mouse for any length of time. This causes damage to the tissues that builds up over time. The Zero Tension Mouse allows you to rest the arm and shoulder on the cradle for the hand. If you keep the mouse relatively close to the body the entire arm, shoulder and neck will relax. Most people feel an instant relief when switching to the Zero Tension Mouse. Repetitive motion injuries in the US alone account for as much as $100 billion in medical costs and lost productivity (by dave tf support). Active Release Technologies' aim is to reduce that number, but more importantly, their aim is to enable you to work without the pain and disability of these injuries. Windows 2000 Professional or Server. Windows XP Home Edition or Professional.